V or Flat belt cross length calculator - formula & step by step calculation to predict the V or Flat belt length required to connect two pulleys for mechanical power transmission. L = 2C + [π(D2 + D1)]/2 + [(D2 + D1)2]/4C. Center distance between two pulleys C in inches, first pulley diameter D1 in inches & the second pulley diameter D2 in inches are the key elements of this calculation. The below mathematical formula is used in mechanical engineering to calculate the V or Flat belt length required to connect two pulleys for mechanical power transmission. Besides, the step by step calculation for each calculation performed by using this belt length calculator let the users to know how to perform such calculations manually. In the field of mechanical engineering, while working with mechanical power transmission, sometimes it's important to analyse length required to connect the two pulleys. 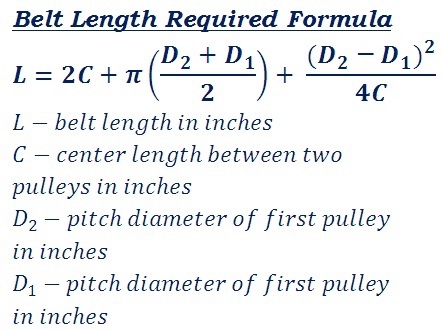 The above formula & step by step calculation may be useful for users to understand how the values are being used in the formula to find the belt length, however, when it comes to online for quick calculations, this v or flat belt length calculator helps the user to perform & verify such mechanical engineering calculations as quick as possible.